If you love the look of paper lanterns, but are ready to move away from that dorm-room-casual look towards something more sophisticated, then you might like this hanging Petra Pendant Lamp from Crate & Barrel's home collection for Fall 2011. This impressive 18-3/4" diameter lamp would make the perfect centerpiece hanging over a conversation area, a dining room table, or how about over a grand piano? The shade is actually a sculpture of iron wire with an antique copper finish and looks like it would possess a modern elegance with the light filtering through. 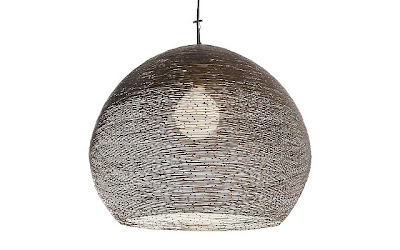 Unlike, a paper lantern, this lighting fixture needs to be hardwired. This Crate & Barrel exclusive retails for $449.